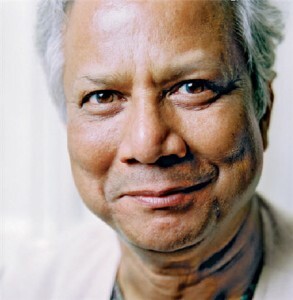 The philanthropy and microfinance sector is nearly united in opposing an attempt by the government of Bangladesh to oust Professor Muhammad Yunus as managing director of Grameen Bank, the social enterprise for which he won the Nobel Peace Prize in 2006. Prof. Yunus has launched a legal battle on against his removal from the top post of Grameen, a dismissal seen by many as part of a political vendetta by the Bangladeshi prime minister, Sheikh Hasina. The Bangladesh central bank’s board of directors voted to remove Yunus, claiming that at 70 years old he was is well over the mandatory retirement age of 60, a situation it had ignored for years. But most observers say the ouster stems from out-dated charges of misappropriated funds and political tension between Hasina and her ruling party and Yunus, one of the world’s best-known figures. (The Bangladeshi government owns 25 percent of bank by statute). And the U.S. government signaled hits displeasure with the action as well. The State Department said it was “deeply troubled” by the Bangladeshi’s central bank’s efforts to fire Yunus and that Hillary Clinton, Secretary of State, would discuss it with him in Washington next week. As Grameen points out, it is owned by its 8 million or so borrowers, most of them relatively poor women. It remains to be seen if the voice of these owners will be heard. There is a real danger that what is in effect an attempted takeover by the Bangladesh government will do serious damage to Grameen and the people it helps. While there are certainly examples of for-profit microlenders harming the poor, we think the greater harm to the poor is often done by the politicians who purport to be on their side. We fear this will be anther example of that shameful truth – and can only hope that, even at this late hour, common sense will prevail, and that the government of Bangladesh will leave Grameen and its founder alone to get on with the work they have hitherto been doing so well. Perhaps, the most surprising thing in this whole saga is how much of its international reputation the government is willing to risk in order to remove Muhammad Yunus from Grameen Bank. It is difficult to see what there is to gain from Mr Yunus’s removal, apart from the satisfaction in satisfying a grudge—unless, is it possible?—the government intends to take control of the bank, and use it for its political purposes. Whatever the motive, Sheikh Hasina’s government has chosen to join the ignominious little club of governments who turn against their own Nobel peace-prize-winning citizens.